Okay, so as many of you are probably aware, from billboards, TV Spots, Viral Internet campaigns, ect. that a "new" Spider-Man movie is coming out on the 4th of July. In America, it's expected to take over $150 million in the box-office on it's opening weekend alone. Except, as you can probably ascertain from my use of inverted comma's, It's hardly new. It's a prequel that reinvigorates the entire series, and sets everything back to year zero, where Peter Parker as recently gained control of his abilities, and is freshly exploring them. It was done in Sam Raimi's series, but they seem to have reinvented certain themes that were in the comics, the inclusion of Gwen Stacey as a (valid) love interest, the use of Peter's web-shooters, and the introduction of Curt Connors as The Lizard, who, as you can probably guess, is a giant lizard-man. And while certain of these themes are important to the Spider-Man Mythos, Peter inventing and using the Web Shooters shows his intelligence and altruism (he could have just patented the ultra-strong webbing material and retired), and Gwen Stacey opens up a love tetrahedron concerning Peter and his friends,it still feels a little... Pointless? I guess? Spider-Man has had a rich, 50 year history, and he's had plenty of notable stories that have affected fans, but at the present point, we've struck some kind of universal rut concerning how we tell Spider-Man stories. In the past 10-15 years, we've had a massive series of re-hashes and retcons (retro-continuity) in the Spider-Man stories spread across the media. The Sam Raimi films, the current film series, Spectacular Spider-Man, Ultimate Spider-Man (both the comic book series AND the cartoon series), Spider-Man Noir, Mary-Jane loves Spider-Man and the controversial comic book story line in "regular" continuity, Brand New Day, seem to have sent Spider-Man backwards instead of forwards. Either thematically, they've reintroduced a young, hip, in some way "new" version of the character, or reintroduced certain themes used by Stan Lee and Steve Ditko back in the 60's, the use of social-life intruding on his heroic alter ego, and visa-versa, the fusion of a Teen Drama/Soap-Opera/Super-Hero saga that it once was. In Spider-Man's early years, this was considered, edgy, original and was great for hooking young legions of fan's. 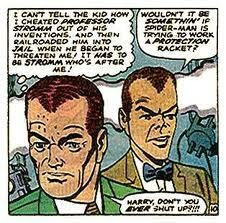 And so the tradition of telling Harry to shut up, a tradition carried out until this very day, began. But in perhaps the last 20 years, the character hit a snag, he was growing up. He was no longer in college, he was a slave to the dollar like anyone else, he was married, he had, in essence, GROWN UP problems. Now, whether it was the difficulty for new writers to put him through the wringer in relatable, yet mature ways, or legions of ageing fan's putting down the comics or even Marvel's realisation of Spider-Man's merchandising potential, Marvel, and Spider-Man's fan's began to realise something. Spider-Man is not a grown-up character. Peter Parker is the constantly anguished, tortured soul who is often unable to ascertain the correct moral path, or recognise the consequences of his own actions, in other words, the perpetual teenager. Adults are usually more morally upstanding, someone to be replicated. It's probably the reason why a character like, say, Batman is considered mature. He's so righteous and morally justified in his actions, it's easy for more grown up fans to follow and place on a pedestal. Spider-Man's (ironic) irresponsibility, and striving for a consistent ethical path, the juggling of social life and other obligations is something younger fans find more relatable. Of course, I doubt even though we all do adult things, pay rent, work a job we don't like, and generally put on a brave face against the rest of the world, that we feel in control of our lives, or that we feel as grown up as we think we are, which I think still explains Spider-Man's appeal to older fans. Perhaps as a way to retain a piece of one's youth in the face of an overwhelming adulthood as much as anything. Spider-Man (despite the name) is an overgrown kid. A motormouth that's always poking fun and cracking jokes at his enemies expense, with near limitless energy and (dare I say it) archetypal "adult" enemies. 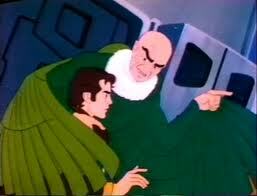 The Vulture maintains a literally generational conflict, not to mention Norman Osborn's sinister connotations as a sadistic father-figure. Even Kraven the Hunter is testosterone dripping example of primal manhood. "Hey, Kid, do you want to take a look at my sub-text, if you know what I mean..."
So the real problem is how to keep a character that's marketable as a youth icon, and be able to let him mature and grow at the same time. It's a tricky conundrum made worse by a sense of nostalgia, and the thoughts of writers and fan's that the Spider-Man stories of the 60's were part of a "Golden Age", a time of now unattainable originality and greatness that contained the absolute and concrete version of the character. that's why we've seen a resurgence in retcon's and redo's, where Spider-Man fights classic characters that are virtually the same fights as they were 40 years ago. Social relationships that have already reached their logical conclusion begin all over again to pander to a new generation. and all the while, the stories that allow a new kind of Spider-Man story to come into genesis are still-born or aborted to take a "fresh" take on an old formula. "Back in Black" a story arc where Peter Parker revealed his Identity to the world, and where his Aunt May was shot, his wife Mary-Jane was forced to flee underground, and his pantheon of villains baying for his blood allowed this new kind of story to appear. Peter's Past mistakes had caught up with him, and he had to face the music, either become mature enough to handle the loss of his sole parental figure and protect what was left of his family. This was a MAN'S story. Of course, a retcon in the form of "One More Day", came calling, where Peter literally sold his marriage to the Devil so he could wipe out everyones memory of his identity, and the life of his Aunt back, occured. Conveniently allowing him to be free from the responsibility of marriage, AND guilt from the loss of his aunt, and continue his life as a Man-Child. Ultimate Spider-Man is even worse, this version of Peter Parker died at 16, only having started his career at 14, just as his character exhibited character growth and maturity, and then was replace by a new Spider-Man, Mike Morales, another 14 year old that has to get to grips with a complicated social life, alter ego and new powers. He still faces all the old enemies. I think we've reached a stagnancy when it comes to Spider-Man stories. I'm sure it's not a problem for most people, but I've spent all of my teenage years reading and watching essentially the same story over and over again, and no matter how skilfully or innovative it is, it still isn't original, and that's something I need. Other comic book writers, like Scott Snyder and Grant Morrison are endeavouring to try and inject something that hasn't been done before into Batman stories (introducing cosmic and psychological motifs), a character that's been around 30 years more than Spider-Man, and they're actually doing a pretty good job, which makes me wonder what's wrong with the writers at Marvel. 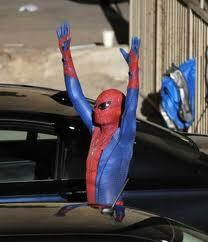 Regardless, I'm probably not going to go and see "The Amazing Spider-Man" in the cinemas. It's a little too depressing. I'm raising my hands in the air, because at this point, I just don't care.